Note that WinBoard 4.4 has been superceded by WinBoard 4.5 as stable version. WinBoard 4.4 is the merger between the forked developments of the official GNU XBoard team (the never-released version 4.2.8) and the Winboard_x - WinBoard 4.3 development that can be obtained from here in the positing below. A special version is available for visually impaired people, for working with the JAWS screen reader, see the post below or click here to get there. WinBoard 4.4.0 contains all the niceties of version 4.3.15, and for some more screenshots you are encouraged to look there. WinBoard 4.4.1, 4.4.2 through 4.4.4 mainly are bug-fix releases of it, although 4.4.1 also has some new features. (Chat windows.) WinBoard 4.4 can be downloaded as an installer package from here. This installer contains all essential support programs, such as Polyglot and PSWBTM, pre-installed and ready to run. In this respect it is similar to the WinBoard 4.3 Gold Pack. It contains two demo engines, a native WinBoard engine (Fairy-Max 4.8) and a UCI engine (Fruit 2.1). If you already have WinBoard 4.4.0 installed, you can simply replace the winboard.exe in its WinBoard folder by unzipping the executable of 4.4.3 downloaded from the link below. The 4.4.3 installer package also contains Tim Mann's bugfixed version of timeseal. Th 4.4.4 installer contains a new adapter, UCI2WB.exe, which can be used to run UCI variant engines (in particular Xiangqi and Shogi (USI) engines, but it really does not care much about the variant, and supports normal Chess as well). Download experimental WinBoard executable (486 kB), (with ICS seek graph, see posting below). This installer also contains optional sections for using WinBoard as a Xiangqi (Chinese Chess) GUI, and for general Chess Variant afficionados. For more information about the Xiangqi capabilities of WinBoard, look here. The variants section provides engines for in total more than 20 widely different Chess Variants (most of them through the Fairy-Max and Pulsar engines), ranging from Chess960 and Gothic Chess to Crazyhouse, Losers and Atomic. 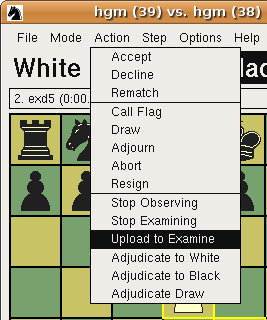 For the exact rules of these games, see http://www.chessvariants.org . The source code for WinBord 4.4.4 and previous versions can be obtained frm the GNU XBoard source repository. Use the tar ball that is tagged v4.4.4 (xboard-4.4.4.tar.gz). Most unzippers should understand this format (e.g. 7Zip). WinBoard 4.4 contains many new features compared to its predecessors. From the GNU repository came the new feature to use engine analysis in ICS mode, so you can now analyze the games you are observing. 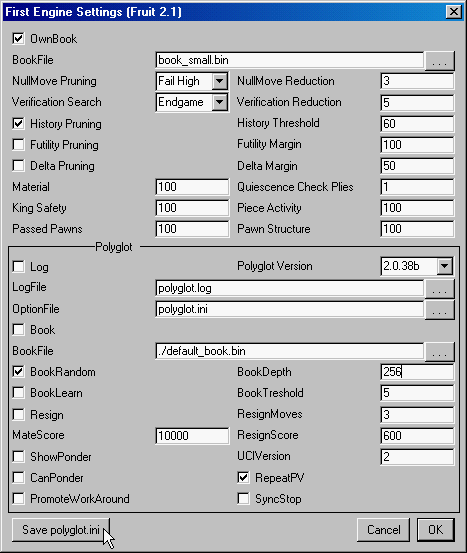 From yet unreleased 4.3 development came the possibility to set engine options through a GUI dialog. Note that next to the stable 4.4.4 version, the GNU repository also hosts the sources of a development version, (with many new, but experimental features (latest release tagged as master-20100810). You can find more about this development version at http://hgm.nubati.net , where you can also obtain WinBoard and XBoard binaries including these experimental features. You would be most welcome to test them, but keep in mind that it is to early to guarantee that addition of the new features has not broken anything. Other new features are the possibility to lower the CPU priority of engines (so WinBoard will run more smoothly on heavily loaded systems), an option /noGUI to suppress most display functions to facilitate the use of WinBoard as GUI for ultra-fast (sub 10-sec) games, and the possibility to display engine logos through the options /firstLogo, /secondLogo or /autoLogo. The Winboard_x /stickyWindows feature, which makes all contiguous open windows behave as if they are one big window, which was broken on Windows XP and Vista, has been repaired, and extended to make more windows participate in it (e.g. the game-list window). For playing engines on ICS there now is an /autoKibitz option, which makes an attempt to treat you opponent engine on the ICS as if it were running locally, diverting its kibitz of PV info to the Engine Output window, and including its depth and scores in the PGN. WinBoard 4.4.1 allows you to open chat windows in ICS play, which are dedicated to conversation with a single other ICS user or a specified channel. It also fixes the premove (so that you can again enter recaptures as premoves in ICS play), and some bugs in the GUI book. Many other small bugs were fixed as well, in particular bugs affecting ICS play (such as keeping the engine in sync during examining a game). A new -keepAlive option can periodically send a "date" command to the ICS to prevent you from being timed out (do not use frivolously!). WinBoard 4.4 implements extensions to WinBoard protocol, which now allow native WinBoard engines to do what was formerly reserved only for UCI engines. Not only can engines now request their hash-table size and maximum number of CPUs to use from the GUI through the memory and cores commands, but they can define their own, engine-specific options for the user to set through the GUI, similar to UCI options, through the option feature. The description of the extended protocol can be viewed here. Version 4.4.4 also includes a new XBoard. This of course supports all the new back-end features, such as -autoKibitz and the protocol extensions. It also implements several command-line options that were already avaiable in WinBoard, but (for no good reason) not in XBoard. 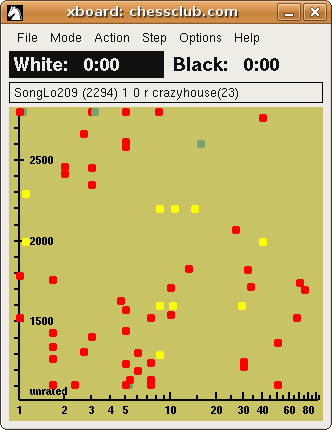 XBoard 4.4.4 has improved display handling in variants such as Crazyhouse and Shogi. It will be available from Debian and Ubuntu repositories. A Debian package is also available from WB forum or the GNU XBoard home page. People using other Unix / Linux distributions can install from souce. The sources are kept at the GNU XBoard home page. Last edited by H.G.Muller on 05 Sep 2009, 13:01, edited 4 times in total. Alert: WinBoard 4.4 for JAWS has been superceded by WinBoard 4.5 for JAWS, click here. There is a specially adapted version of WinBoard 4.4 available for working with JAWS. This version can be controlled completely from the keyboard, as blind people cannot use a pointing device like a mouse. It is equiped with a special menu (and accelerator keys to activate the items in it) to have JAWS recite the position of pieces on the board, the last move made by the opponent, (which is also announced spontaneously), etcetera. WinBoard 4.4 for JAWS has all the functionality of WinBoard 4.4.1, and will enable blind people to access and analyze Chess games in P G N files, play Chess on an Internet Chess Server such as FICS, or play against a Chess engine. 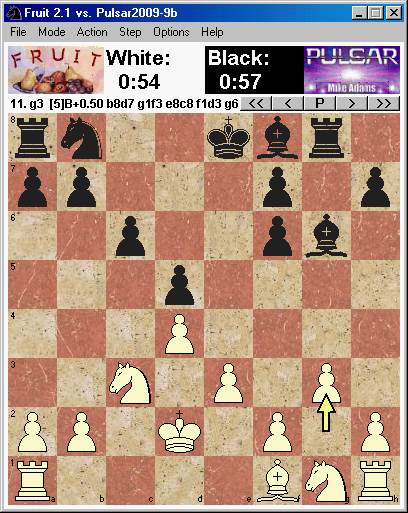 WinBoard 4.4 for JAWS can be installed from the WinBoard forum with Fruit 2.1 as optional demo Chess engine, by clicking the link below. Note that per Nov 2 this download contains an updated version 4.4.1, which fixes many small bugs from 4.4.0. Some people have experienced problems downloading the file. If your system complains that the file is incomplete or damaged, check the size of what you downloaded. If necessary, choose "Save" in stead of "Open" from the download dialog initially, so that the file is saved, and then open it later. If its size is not 1,304,040 bytes, the download must have been interrupted, and you should try again. Last edited by H.G.Muller on 05 Sep 2009, 12:58, edited 3 times in total. Scotti's WinBoard_x, which again was derived from WinBoard 4.2.7, the last version released by Tim Mann's team. move to your desktop. No other install is needed. bug-fixes: Polyglot 7-jan-09, WinBoard 14-jan-09. Windows executable, plus Fairy-Max demo engine, ready to use after unzipping. Linux executable (Ubuntu/hardy), plus Fairy-Max demo engine, ready to use (tar archive). Complete (zipped) source tree, including all bitmaps, for WinBoard and xboard. from which a Linux version can be compiled. 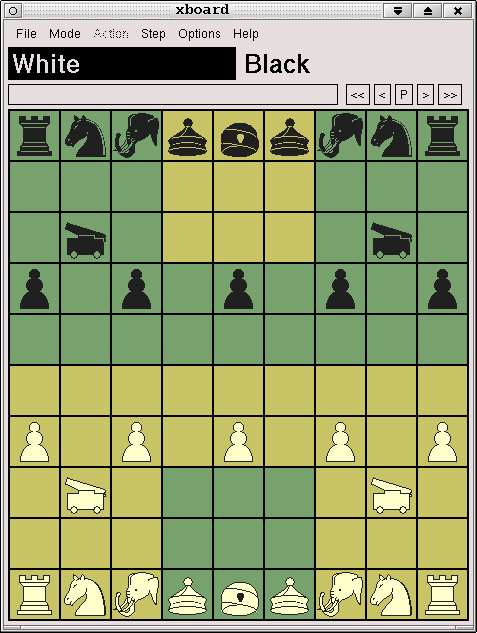 WinBoard is a Graphical User Interface to conduct a single Chess game or match between two opponents. WinBoard 4.3 in reaction to the various commands, and explains how you could use some new features. though. We hope to narrow the development gap between xboard and WinBoard in future releases. and a Chess font defining the pieces. Many suitable Chess fonts can be found at the EN PASSANT website. Some nice textures can be found at the Winboard_x website. Next to the stable versions described above, there is a WinBoard / XBoard development version. It is likely to be less stable, but it has many more features. For instance a seek graph, that can be used to easily challenge opponents on an ICS, the possibility to peek at your bughouse partner's game while you are playing, an upload command for games to the ICS, and smart-move. Such WinBoard versions have a name derived from the date they were made, like WinBoard 4.20100215. Eventually, these features will end up in a stable version, after they have been sufficiently tested. For an exhaustive description of the new features, and how to use them, see: http://hgm.nubati.net/news.html . This version (WinBoard 4.20100222) is now available as Windows installer, which contains a minimal install tailored to ICS users. It contains timeseal and timestamp, the Fairy-Max engine, Polyglot 1.4.56b, the help files, and a prepared winboard.ini settings file that makes it all work 'out of the box' . It will create menu items for connecting to FICS and ICC, playing against Fairy-Max and the general WinBoard startup dialog, plus a README file that explain how to use the new ICS features (seek graph, observing your bughouse partner's game, one-click move and chat boxes) must be used. The hottest (but sometimes buggy) sources can also be obtained from nubati.